It’s the compact V8 family supercar for all occasions. Unlike rivals from Alfa Romeo, BMW and Audi, the Mercedes-AMG C63 is available not just in two power outputs, but a full four bodystyles. You can have a deliciously wide-arched, outrageous-looking two-door C63 Coupe, or a canvas-roofed C63 Cabriolet. Need four doors? Then choose between the subtle C63 Saloon, and the coolest of the long: the rare and special C63 Estate. All four variants are available in standard 463bhp/649Nm C63 guise, or in C63 S tune, complete with 503bhp, 700Nm, a Race mode and a ratcheted traction control system that lets you turn up or dial down how much assistance you’d like. And that’s the tip of a technical iceberg. For the revised 2018 family of C63s, there are two headlines: a new gearbox – inherited from the AMG E63 big-brother – and a LOT of modes. Modes for the differential – which is now electronically actuated in both the C63 and C63 S – modes for the suspension, the engine, gearbox, exhaust, traction and stability control… even the standard-fit digital dashboard has three different display choices. Rivals include the Alfa Romeo Giulia (sedan only), the BMW M3 and M4 (sedan, folding hard-top and coupe, but no wagon) and the Audi RS4 and RS5 (no cabrio or saloon), plus the more artisan Lexus RC F coupe if you’d like your V8 thrills sans supercharger. Thing is, while these cars all score points over the C63 family in minor areas, none is able to beat them overall as a package. Fundamentally, the C63 is a car blessed with a world-class engine, brilliant gearbox and wonderful chassis. And yet, despite AMG’s superb work, you can still mess about with it, tweaking and changing its behaviour. Because, for 2018, the C63 has gone mode crazy. The Dynamic Select modes are now Slippery (you big wuss), Comfort (which is on the very firm side of comfortable) then Sport and Sport +, which ramp up the engine response (via shorter throttle mapping), gearbox behaviour, suspension stiffness and exhaust noise. Race mode is a C63 S-exclusive feature for maximum attack track-focused blood and thunder. And of course, you can pick all your favourite settings and save them in the individual mode for the best of all worlds. As before, you can switch between the modes using the rocker switch on the centre console, but there’s also a second toggle now, hanging on the right-hand side of the steering wheel. Twist the knob, Ferrari-manettino style, to change modes, or click the face to shortcut straight to individual. Turn the traction control all the way off, and this dial morphs into a nine-stage ratchet for how much traction control you’d like to intervene. It’s a system inherited from the AMG GT R, and its adaptable safety net is really addictive. This generation of C63 has never had brilliant steering, but the weighting is at least less gloopy than the BMW M4’s, and less glassy than the numb Audi RS5. It’s also a mite slower than the Alfa Giulia QV, so the car feels less hyperactive when you’re changing direction quickly. The coupe is a 1,735kg car – heavier even than the saloon, thanks to its 50mm wider rear axle with massive reinforcement – but the C63 disguises its mass magnificently. Aiding the handling is a new feature for the facelift car: AMG Dynamics. What’s that, you say – you want more modes to play with and configure? Well, step right up. AMG Dynamics is a four-stage system for tweaking the behaviour of the electronic rear differential’s lock-up phase, its torque vectoring, and how it interacts with the stability control. Its most benign setting is called Basic. Next up, Advanced mode. Pro mode is for fast road driving, where agility is key, and then there’s a worryingly titled AMG Master setting as a last resort, which sets everything up for, well, masters. That’s the Driving God defcon, and will assist you in wrecking your rear tyres as efficiently as possible. Meanwhile, the gearbox is a bit of a triumph. Sorry, BMW M, Alfa and Audi RS, but the C63’s Achilles’ heel has been properly armoured up this time. In the old car, the gearbox was the weak link in the crackers powertrain. It was the flaw you drove around, hesitating for downchanges in particular. That’s gone now. The throttle blips when you drop from fourth, to third, to second are crisp and the changes slot home accurately. The highest compliment you can ever pay any technology is to stop noticing it working at all, right? After half an hour in the C63 S Coupe, you’ll forgot the gearbox used to be a pain in the backside, and shifting for fun. Worth doing too, just to provoke the furious change-up lights as the inertia-free V8 scorches towards its 7,000rpm redline. Inside, the new C63 gets a 12.3-inch fully digital dashboard screen as standard, and while you can endlessly swipe and flick between info-overload submenus via the fussy steering wheel’s touchpads, its party piece is an angry red strobe effect as the engine rampantly accrues revs. It ought to come with an epilepsy disclaimer. Warning: This Car Contains Flashing Images. It’s ridiculous. It’s hilarious. Pretty much sums up the C63, really. You’ll have to be a true AMG Master (or a bit of an anorak) to pick the saloon, estate and coupe apart from behind the wheel. At road speeds, they’re all mighty accomplished. The soft-top is ever so slightly less good, because it weighs getting on for 1.9 tonnes, and you can feel the structure’s not as stiff. Happily, this means AMG has softened off the ride to where it always should have been, and the soft-top is a cracking road car as a result. Blunter, sure, but the noise is so overwhelmingly raucous, it makes up for the soft-top’s mathematical shortcomings. If it’s alright with you, we’ll start at the front, because the coupe, cabrio, saloon and estate all share this bit of their interior. And it’s where you’ll drive it from. Makes sense, huh? The driving position is spot on, but the bucket seats are rather firm, so aim to try before you buy. The C-Class certainly has the most attractive cabin in the compact exec class, save for perhaps the Audi A4 – some of the panels are a touch creaky on the centre console, and the C63’s punishing ride won’t do that many favours. But it’s a richer, more interesting environment than a BMW M4 or Alfa Giulia QV. Rear seat space is a C-Class strong suit – the two doors obviously suffer for this, but they’re about on a par with a Porsche 911. The estate has a 490-litre boot, expanding to 1,510 litres with all the seats folded near-flat. All the car you’ll ever need, so long as you get the chance to unleash all 503bhp without having the kids, pets or valuables aboard. The AMG C63 is one of the very best cars on sale. It takes a desirable but not especially interesting small Mercedes and creates a truly special vehicle. In fact, slightly awkwardly for AMG, the C63 is actually a better all-round coupe than the AMG GT, a superior fast wagon to any of its SUVs, and gives the bigger E63 a run for its money as a super-saloon. How can that have been allowed to happen? 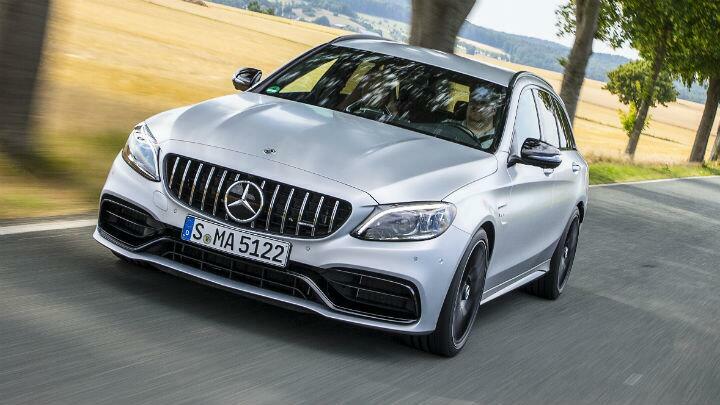 What’s more, the C63 has its immediate rivals from other companies licked too. BMW’s M3 CS gets closest as a sharp sports saloon, but it’s a £90k car – and there’s no way it’s worth a third more than a well-specced C63. The estate nukes an RS4 – it’s just so much more special. And the coupe and cabrio have their BMW and Lexus rivals on toast, as all-rounders with big hearts, big safety nets, and an intoxicating blend of new-school tech with olde-worlde firepower. Yes, some of the switchgear is nasty. Yes, it’s too complicated in the initial set-up. And yes, it’s heavy and anachronistic. But very few machines on sale right now make such an appealing head and heart case for themselves. We’d like a C63 S Coupe for the weekend, and a non-S wagon for the school run, thanks.